In the current age of technology all the individuals across the world, who are running a restaurant business are liking and interested to add a digital software system into their restaurant through which they can upgrade themselves according to the latest trend and also enable their customers to order and get the food parcel in their hand anytime and anywhere with the use of a technology. Hence the restauranter of every level of the restaurant is attracted towards to integrate a digital food menu ordering and delivery system into their business which also comes with an in-built whit label services. Each restaurant business has its own different name, theme, design and menu list, thus, we are delivering a fully flexible, easy to operate and 100% customizable services so that, now you can edit this restaurant ordering system as your choice and theme of your restaurant including, the business logo, color, menu list, items description and more. We have updated the services of this online ordering software in the form of a ready to use format, so you can add it into your restaurant at any time by just following a simple method of addition. Adding our online food ordering system is a one-time investment, which you can grab at a cost-effective pricing package on a monthly and yearly basis, and in the revert, you will gain an un-countable profit. Digital menu ordering system is one of the most cost-effective ways to run a restaurant with the current trend of modern science and technology. Send a push notification to all your customers and of course to the individuals who are not yet being your customers, about the latest happenings and updates of your customer by creating a beautiful email template and a well-written message in an easy to get and creative language. Sending a push notification is the best way to entice more customers. This application will become your online business boost partner, as it allows you to accept and deliver food orders form your customers across the city by following a fully functional digital process of the online ordering system application. Emenu is a kind of online food ordering and delivery system, which grants you to control each of its features and functionalities easily, which includes, the updation in the menu list, photo gallery, customers details, and location, etc. 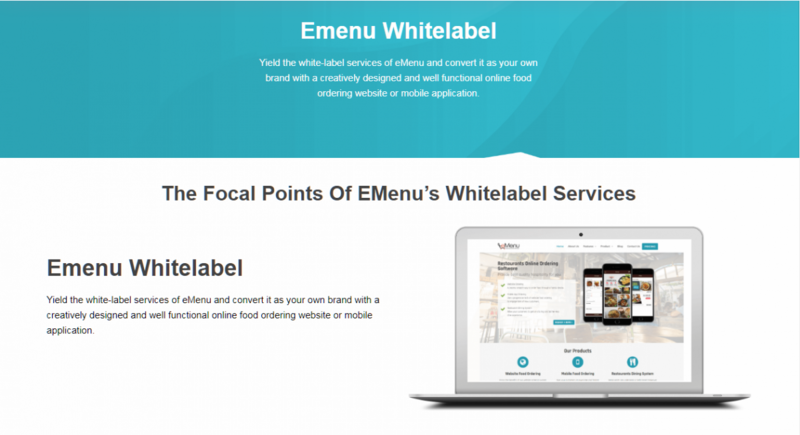 With eMenu’s white labels you will get powerful integration assistance which mentions the easy to adopt features like tablet ordering, table reservation, easy to pay, real-time order tracking, customers order management, and many more. Apart from all the other business boost features and facilities, this digital menu application will permit you to get the exact detail of the number of app downloads and installation and its actual performance in between the audience.